Fulfill an apocalyptic prophecy to satisfy Sheogorath's morbid sense of humor. Once you have reached level 2, travel to the Shrine of Sheogorath and speak with Ferul Ravel. Travel to Border Watch and set up the plague of Disease and the plague of Famine. Return to Sheogorath after he completes this "apocalypse", and receive Wabbajack as your reward. Sheogorath's Shrine is located on the border to Elsweyr, halfway between Bravil and Leyawiin. You must find the shrine on your own; no one will tell you where it is. You must be at least level 2 to start this quest. Once you reach his shrine, talk to Ferul Ravel. You will be told to supply a head of lettuce, a Lesser Soul Gem, and yarn. All are quite common; lettuce and yarn are commonly found in random house clutter, and both are guaranteed to be in a number of homes in Border Watch. The Lesser Soul Gem might be slightly more tricky to find; several locations in Bravil, such as the local Mages Guild and the nearby magic shop A Warlock's Luck may have them. If the Shivering Isles expansion is installed, many shrines to Sheogorath in the city of New Sheoth will have these offerings. When you have the items, return to the shrine and activate it. Sheogorath (or Haskill, if you are far in the Shivering Isles questline) will give you the assignment. While Ferul will tell you to wait for the rain to talk with Sheogorath, this is not true. Another mortal dares to summon me, and already I am bored. But enough about me. Let's talk about you. I could turn you into a goat. Or a puddle. Or a bad idea. I could make you eat your own fingers. Or fall in love with a cloud. Perhaps I could make you into something useful. Let's find out. Does my Champion summon me? Before I've even told you what to do? That's not very Champion-y. Not at all! This is when I should smite you. Give you a serious smiting. Completely smitten. When I tell you to do something, I generally mean it. I suppose there's something I can have you do while you're here, though. A little errand. And a lot of fun. A mortal? Wait... a mortal I know. MY mortal. What are you doing here, mortal, when I've given you things to do? Mortal! You could have just stopped by to see Me. Would have saved you some lettuce, you know. I believe I'm displeased. This hardly seems the time to summon me. Not when Order is busy invading My Realm. Your [sic] mortals are just a hoot. I hate hoots. You, of all people, should realize this is an inopportune time to be in Cyrodiil. Perhaps I've misjudged you. Order is at our doorstep, yet you felt it necessary to offer some yarn to... yourself. An interesting choice, to be sure. Time is a strange thing in the Isles, so this may not set us back, and there is a task that needs to be performed. While I believe that you should be attending to your duties, it is, of course, your prerogative to spend time wherever you wish. Your predecessor did have one task He wanted performed, though He never found a mortal suited for the task. There's a little settlement called Border Watch. It's a nice, peaceful place... and dull, dull, dull. You're going to make their lives interesting. They're a superstitious bunch. Everything is an omen or a portent. Let's make one come true. Find their shaman and ask about the K'Sharra prophecy. You are to find a way to make the first two parts of the prophecy come true. I'll take care of the rest, because it's the most fun. Now, run along. There is a settlement called Border Watch that your predecessor found rather dull. This, of course, offended Him greatly. They are a rather superstitious group, living their lives based on omens and prophecy. One such prophecy, the K'sharra, was of particular interest. Your task would be to make the first two signs of the prophecy occur. Your predecessor already put plans in motion for the final step. Good luck. Once in town, ask about "K'sharra Prophecy" to be referred to the village shaman, Ri'Bassa. Once you find him, tell him that you are a "traveling scholar." If his Disposition is at least 60 he will tell you about the "Three Signs" of the prophecy. To bring the rats, take the wedge of Olroy Cheese from a display box in the Border Watch Inn and place it in the cooking pot outside of the inn, and wait a bit. The case has a very hard lock, and is located in plain sight. Good Sneak and Security skills can be helpful but are not required. If your skills are low, going to the Inn early in the morning when no one else is around and jumping into the corner between the two cases will help to avoid detection, even by S'thasa. Alternatively, you could pickpocket or kill S'thasa and then take the key from her. Or as a final alternative, a strong Charm spell will get you off the hook, even if you get noticed. Once you've placed the cheese in the pot, the rats will appear from the east side of town. After the rats have come, Ri'Bassa will run around placing Rat Poison on the ground for them. After the rats die, take the Rat Poison and head over to the sheep pen, just south of the Inn. Sprinkle the rat poison in the feed trough and the sheep will eat it. Then stand back and watch as they succumb to the poison's effects. You don't need to use the poison on the sheep; using your weapon of choice will work just as well. If you killed the sheep earlier, just wait around a while after putting the Rat Poison in their feed trough and it'll give you the confirmation that you did complete the second phase. Once you have completed the first two prophecies, Sheogorath (or Haskill) will contact you and inform you to head to the center of Border Watch immediately. Once you do this, the Daedric Lord will perform the third and final part of the prophecy. Once it ends, return to the shrine to receive the Wabbajack, a magical artifact that will transmute any creature (non-NPC) into another random creature for 10 seconds. You've done well, mortal. I'm amused, I think. Head into the center of Border Watch. And make sure to duck. Ah, very good. Your predecessor left everything in place for the final sign. You'll want to head to the center of town. Good day. Ah, very good, Sire. your [sic] predecessor left everything in place for the final sign. You'll want to head to the center of town. Good day. Good times. Good times. I hope you had as much fun as I did. Here, take this. It's a fun little toy. Now, go away. Before I kill you. Good work. Good times! Here's a little reward for your efforts. One of my toys. Now, back to business. Before I forget myself. Well done. You should have this, one of the artifacts of the Realm. Perhaps it should have been given to you sooner. Well done, My Lord. You should have this, as it is one of your artifacts. I don't know why I didn't think to give it to you sooner. After you complete this quest, a special edition of the Black Horse Courier is published: "Rain of Burning Dogs!". After the first prophecy it will consistently tell you to talk to Ri'Bassa, even after doing so. Just continue on with the second prophecy to get the quest update. It's also possible to kill the sheep in any way, even before the rats die. It's possible that one of the dogs survives both the flaming descent and the massive fall. Though it doesn't seem to do anything afterwards, as it just wanders aimlessly. All of the dialogue options are spoken by a disembodied NPC, "DASheogorathVoice," whether the voice actor is the original (non-SI) Sheogorath, the SI version of Sheogorath, or even Haskill. The shrine's followers will not recognize you as Sheogorath following the Shivering Isles main quest. Sometimes the sheep involved in the second prophecy will escape the pen. If you are killing them yourself, just search the surrounding wilderness for any that are missing. However, as long as one sheep remains in the pen when you use the poison, there's no need to go hunting the escapees down, as their death is scripted. Since Sheogorath is the Lord of the Shivering Isles, the dialogue you hear during this quest changes after you install the Shivering Isles expansion, at which point the exact dialogue will depend upon where you are in the Shivering Isles' main quest line. Normally, Sheogorath talks to you; his voice changes to his SI voice after you have installed the expansion. However, if you have reached the SI quest Symbols of Office, then Haskill will talk to you instead. Other than these dialogue changes, the quest remains the same. Although Ri'Bassa describes the prophecy as foretelling an event which would force his people to leave their village, the 'catastrophe' does not cause them to flee. Conversely, after the quest is completed, Ri'Bassa will only speak a single line of dialogue and then exit conversation. The German version asks you to look for a "Geringerer Seelenstein" which doesn't exist. Look for a "Kleiner Seelenstein" instead, but be careful, because both the Petty Soul Gem and the Lesser Soul Gem were translated into "Kleiner Seelenstein". If you're not sure which one you have, just drop it on the ground; if it looks like all the other soul gems (like a rock), it's the right one, if it's shiny, it's the wrong one. (More information) ? If you pickpocket rat poison from Ri'Bassa before fulfilling the first part of prophecy, you can complete the second part (poisoning livestock), which will trigger last part, enabling you successfully complete this quest without completing first part, which may leave you with irremovable cheese in your inventory. Ri'Bassa may get semi-stuck as if having a seizure and not place any rat poison at all. Thus is it recommended to either save before placing the cheese or pickpocket poison from him first so you can place it after ? 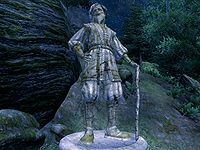 20 Ferul Ravel has told me I'll need a lesser soul gem, a head of lettuce, and some yarn as an offering at the statue of Sheogorath. 40 The shaman Ri'bassa has told me of the K'Sharra Prophecy. The first sign is vermin infestation. The second sign is plague, and all the livestock are supposed to die. I will need to find a way first to create an infestation of vermin. 45 Ri'bassa has suggested I stay at the Border Watch Inn, which apparently has a large collection of cheeses. 47 I've placed the Olroy Cheese into the cooking pot. The smell coming from it is astounding. 50 I have used cheese to lure many rats into Border Watch. I should speak with Ri'bassa to see if he believes this to be part of the prophecy. 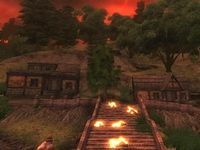 It is possible to use the console to advance through the quest by entering setstage DASheogorath stage, where stage is the number of the stage you wish to complete. It is not possible to un-complete (i.e. go back) quest stages. See SetStage for more information. This page was last modified on 23 November 2018, at 22:26.